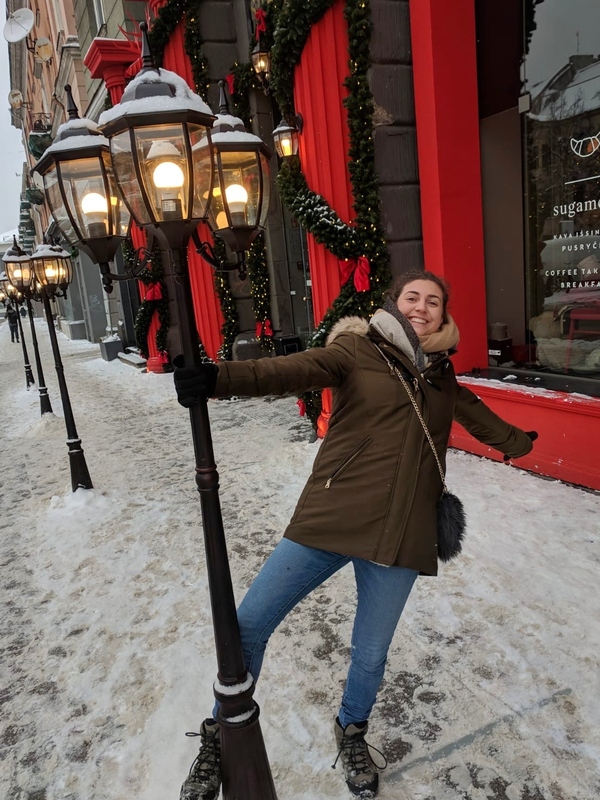 If you’ve read my most recent post, you’ll already know that I spent my birthday weekend in Vilnius wandering snowy streets, eating constantly and drinking plenty of mulled wine. Having not done much research about Vilnius, I was surprised by how much there was to see and do, but also by the fantastic food scene. We ate a LOT on this trip, mainly because minus 11 is pretty cold so required plenty of stops to warm up! The below might look like a list of every single place I stopped, but honestly these are just the highlights! 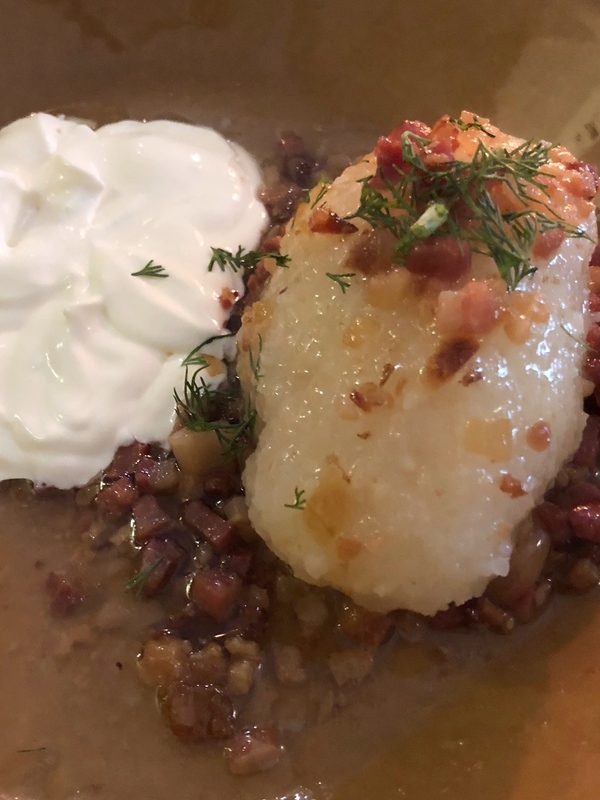 So read on for my guide to where to eat in Vilnius. We only went out for breakfast once, as there was a supermarket around the corner from our AirBnB so we often picked up some pastries in the evening and enjoyed breakfast in bed whilst looking out of the window at the gently falling snow. On the day that we went out for breakfast (me with a hangover and in need of eggs Benedict), I followed a recommendation from a comment on one of my Instagram posts and headed to Sugamour. This place was a treat before we even stepped inside, with a beautifully festive shop front. The interior was just as festive – I’m not sure whether it always looks like that or if they hadn’t yet got round to taking down their Christmas decorations – and the cake display got my mouth watering the second we walked through the doors. 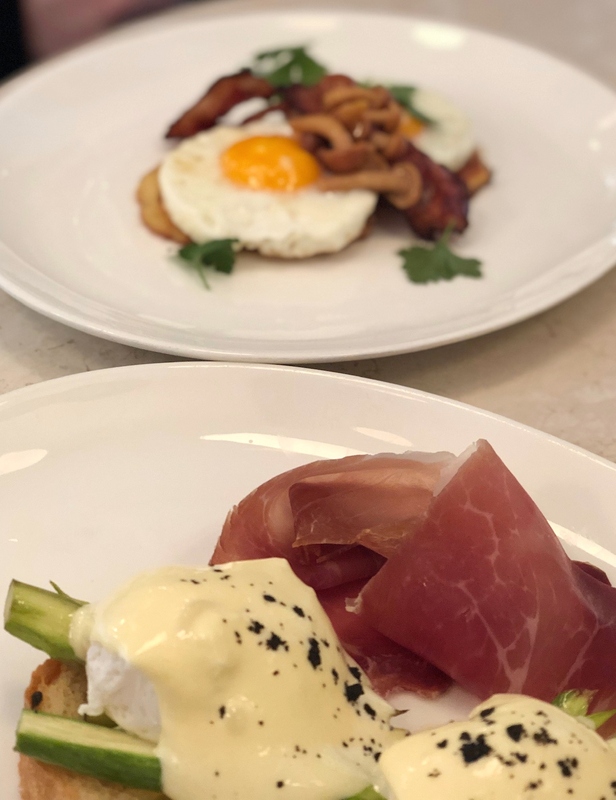 With my craving for eggs Benedict I was overjoyed to see a whole page on the menu dedicated to the dish, and after much deliberation I went for the Spanish eggs Benedict which was excellent. Although this was the only breakfast we had out, we did stop off in several cafés for a quick coffee (and a huge bagel for Billy on one occasion). 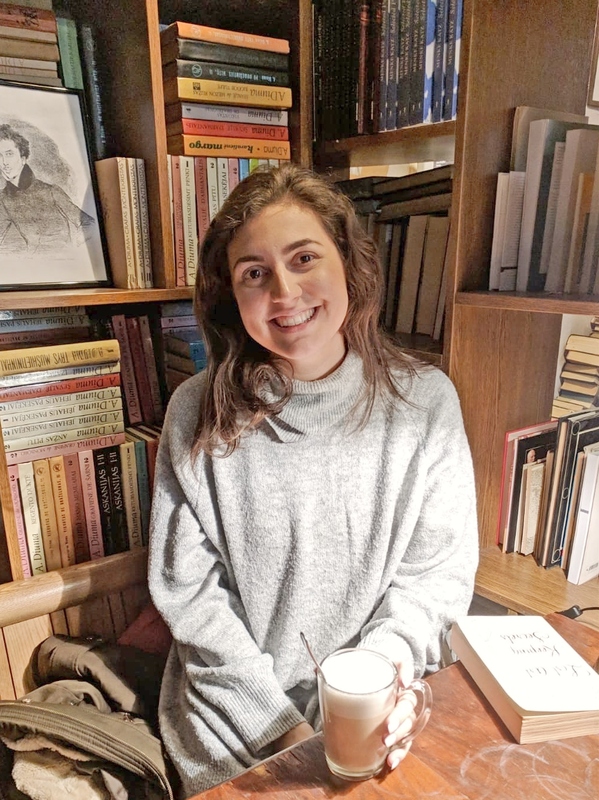 My absolute favourite was Mint Vinetu – a book café with walls lined with books in several languages and plenty of cosy corners to enjoy a coffee and a good read. 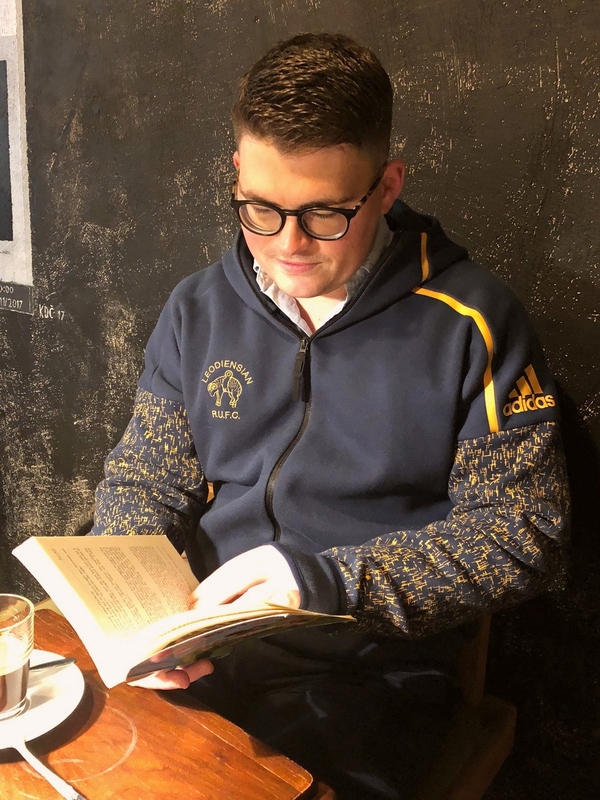 Billy claims to hate reading but even he gave it a go when I found him a book about funny sporting moments. Oh, and the coffee was excellent! We mainly took a grazing approach to lunch, stopping off at various places for dumplings, beer snacks and cheese. These were my favourite snacking places, but they would be just as good for a full lunch or dinner! If you’re in Vilnius and you like cheese, you have to go here. We were actually just looking for a toilet when we walked past this cheese shop and couldn’t resist going in. Stepping inside and realising that we could sit down for some cheese and wine was a moment of pure joy! There weren’t any English menus and so we asked the girl to bring us a selection of her favourites. 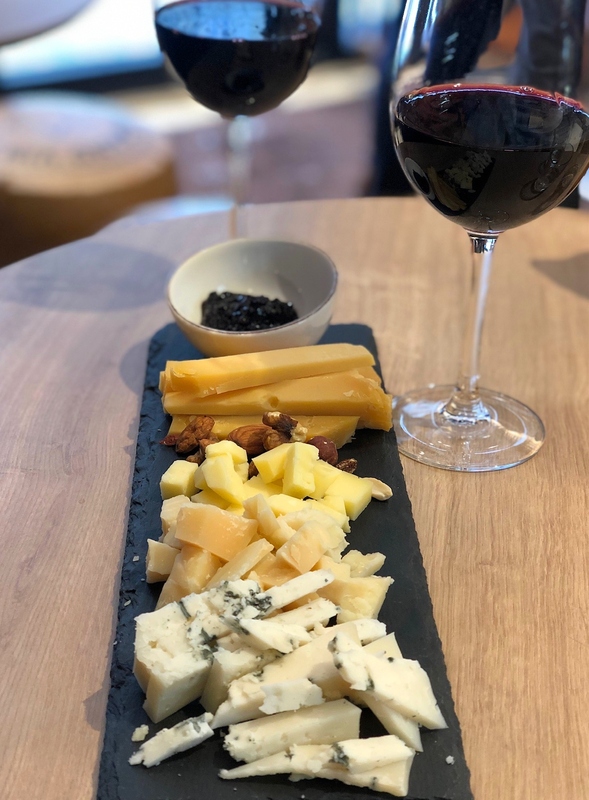 We were literally given a mountain of cheese, and whilst I can’t tell you what cheeses they were, I can tell you that they were all incredible… as was the wine! This family-run restaurant is situated in Užupis, just over the bridge from Vilnius old town. 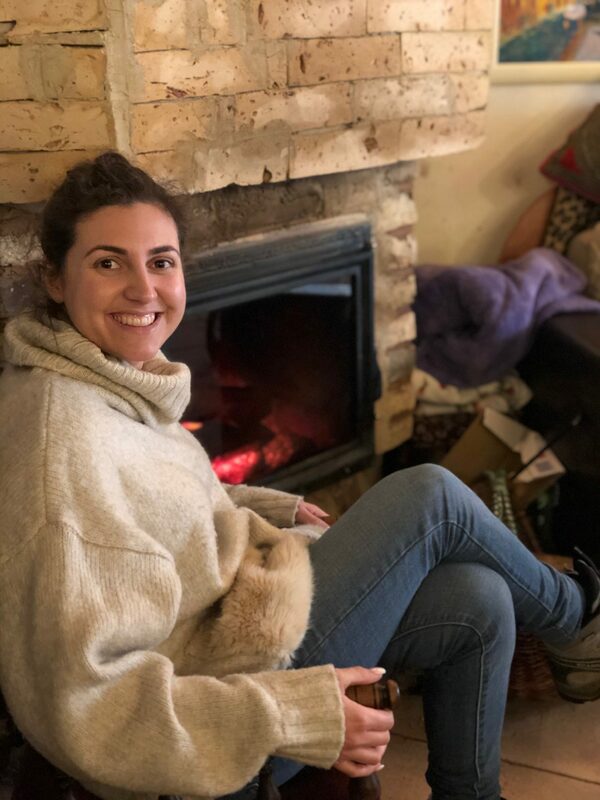 We went in because I needed the toilet (there seems to be a theme here) but ended up staying a while due to the lovely warm fire and a very cute dog! This was where we had our first Cepelinai – Lithuanian potato dumplings stuffed with meat and usually served with a topping of bacon and a dollop of sour cream. This place served them fried, but I later discovered that they’re much better boiled! This was more of a pre-dinner-drink-with-a-snack-because-we-couldn’t-resist place than a lunch place for us, but the food menu looked amazing and it would definitely be worth a visit for lunch or dinner. 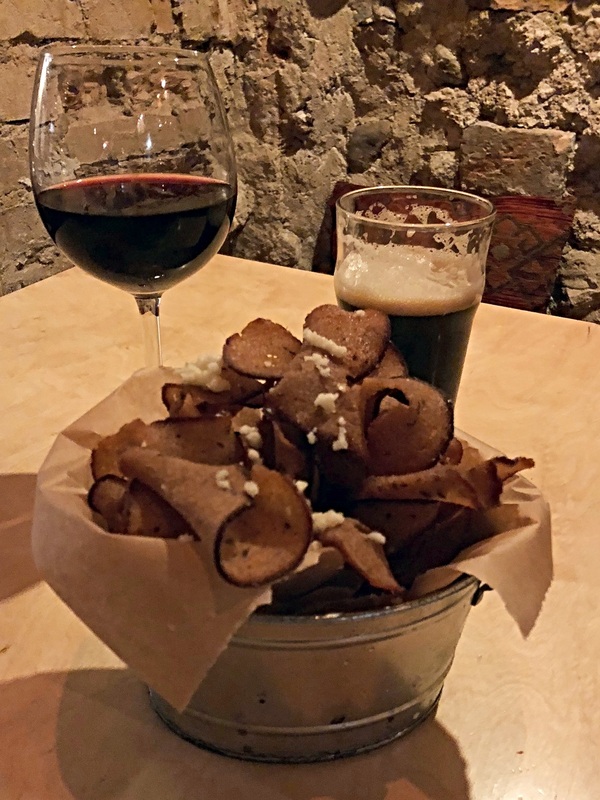 I fell in love with Bromas because it was super cosy, the wine was excellent, the barman was really friendly and made us feel instantly welcome and, most importantly, the bar snacks. One of the best things about Lithuania is that you will commonly be served snacks with your beer – beer snacks – which are deep fried chunks or slices of rye bread. We had a few helpings of beer snacks in Vilnius and these were definitely the best. If you want a hearty, traditional meal and some good beer I would absolutely recommend this restaurant. We started with a tasty flight of beer and a portion of Cepelinai for me (boiled this time) and a beef & beer soup for Billy. 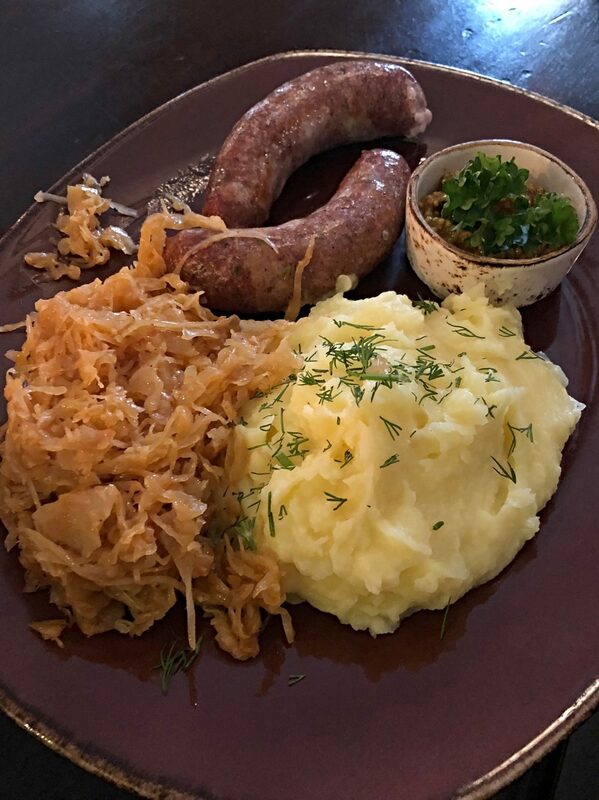 For our main courses I had ‘wild meat’ (venison) in beer sauce and Billy had the biggest portion of sausage & mash I’ve ever seen! This one isn’t actually in Vilnius, but rather Trakai. 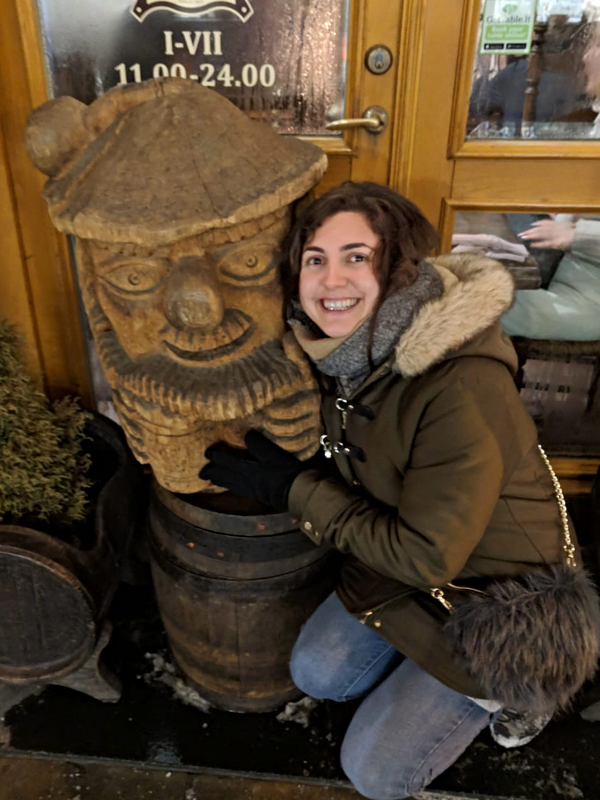 We took a trip here to see the stunning lake and castle and, having heard that you can’t go to Trakai without trying some kibinai, I quickly looked up the best place to get them and headed to Senoji Kibininė. 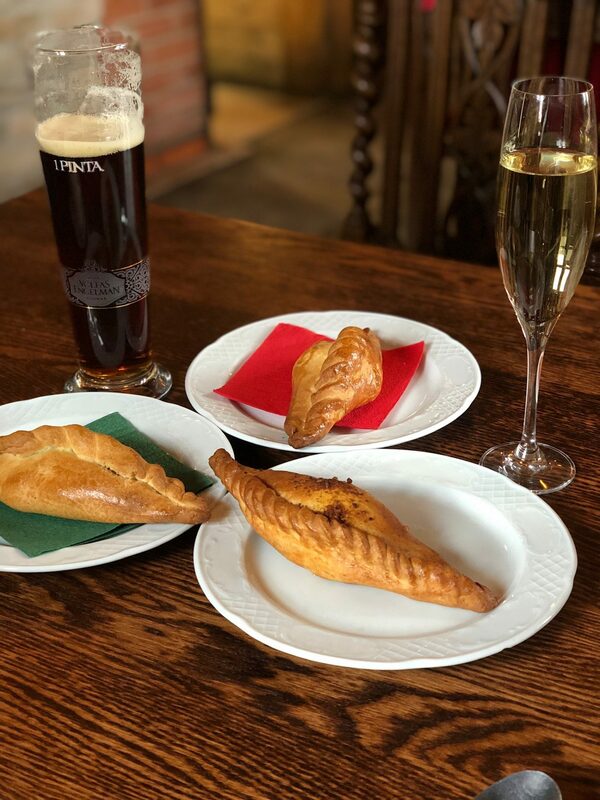 Kibinai are Lithuania’s answer to the Cornish pasty and it turns out they are really, really good! We ordered a selection including venison, veal, beef and my favourite, chocolate and hazelnut. Smooth, silky chocolate and soft, sweet hazelnuts are the ultimate combination… Ginsters need to get on the sweet pasty wagon! 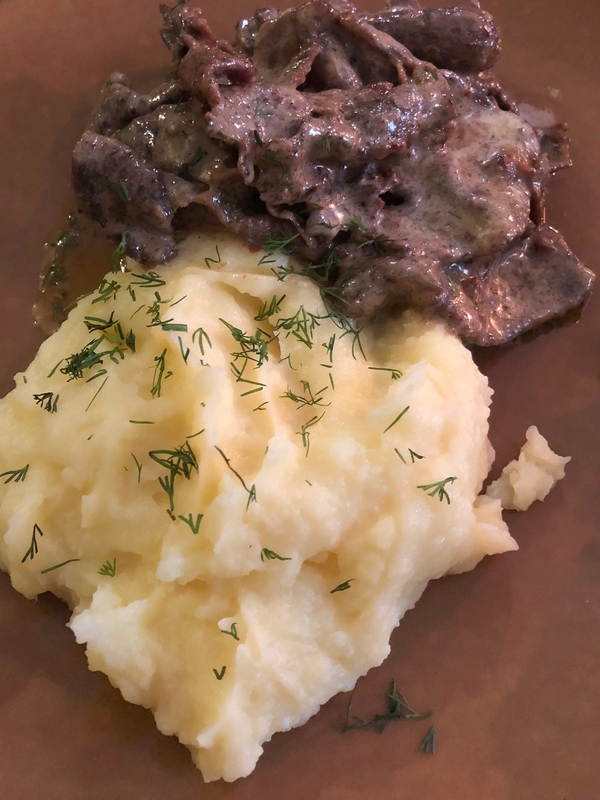 One of my favourites thing about Eastern Europe is that the cost of living means that I can wine and dine like a princess without breaking the bank. So in our usual fashion, we ate at a couple of pretty fancy restaurants. 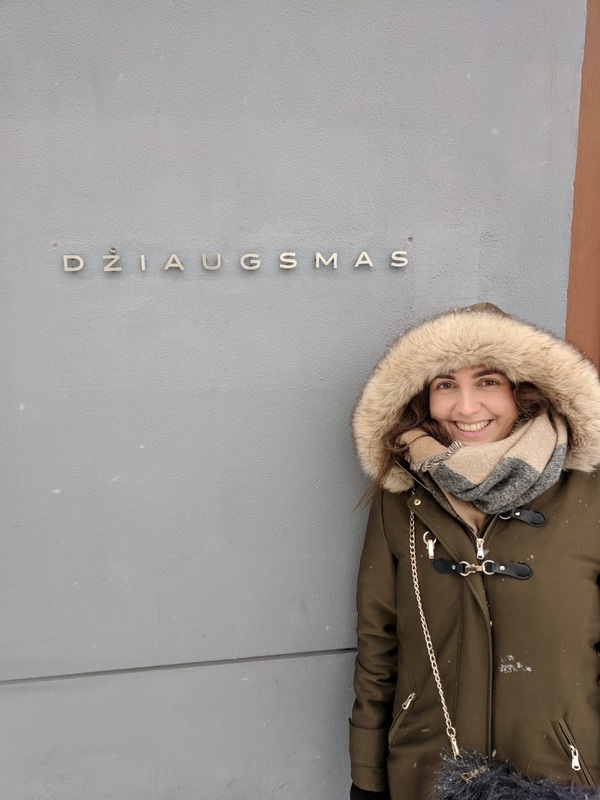 Džiaugsmas (or Dazungazunga as I like to pronounce it) has been named the number one restaurant in Lithuania – ok, I did do a little bit of research – so of course we went here for my birthday dinner. It was a real treat and, surprisingly, didn’t feel at all poncey and I left full! To start we shared some duck doughnuts and some toast with lard and apple jam (sounds gross but it’s so good). 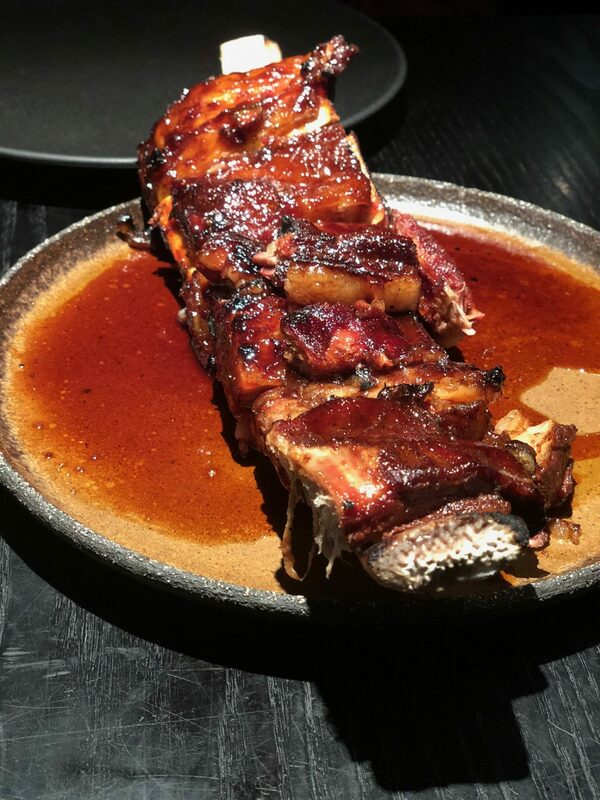 We then shared beef on the bone for our main course which was the highlight of the meal – the meat fell straight off the bone and was ridiculously sweet. We shared a dessert of angel wings (a traditional Lithuanian pastry) which didn’t blow me away, but that’s only because it doesn’t fit with my mantra of ‘chocolate or nothing’ when choosing a dessert. Somm is listed as number nine in the top 30 restaurants in Lithuania, but in my opinion it should absolutely be placed at the top and probably deserves its own blog post. 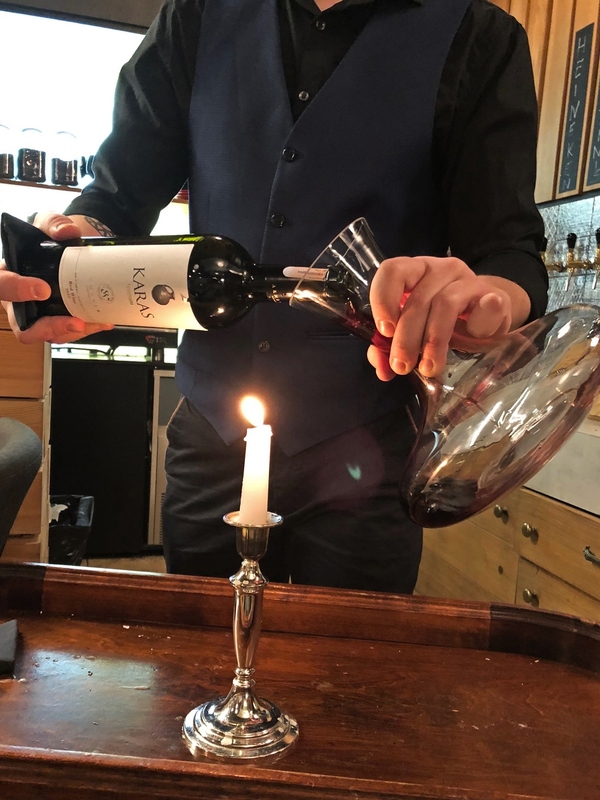 The restaurant revolves around its 450 strong wine list, and I was blown away by our sommelier/waiter’s knowledge of every wine we asked about. We started with a glass of the best Prosecco I’ve ever tasted before moving onto a delicious bottle of Armenian red. 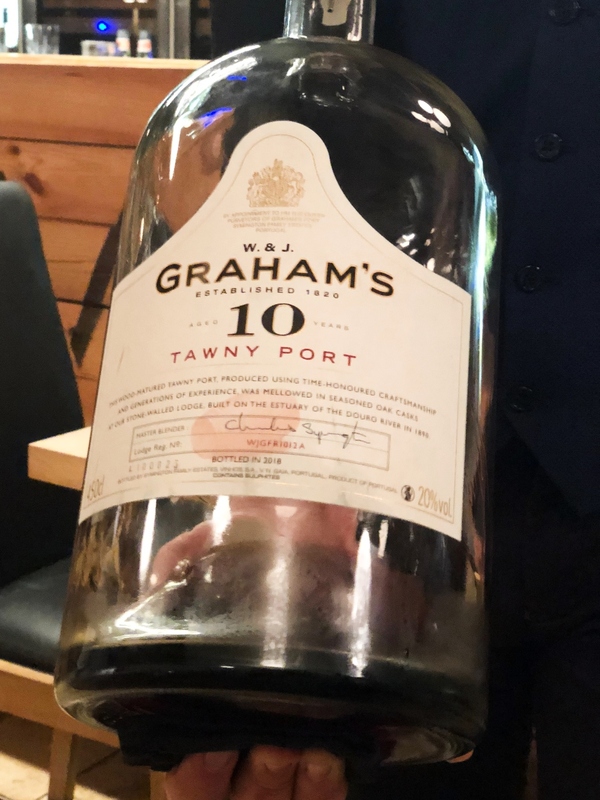 My favourite thing about this (other than the taste) was that it was brought to us on a wooden trolley and slowly poured into a decanter over a single candle… so much care went into making the wine taste perfect for us. You might think that with such a focus on the wine, there would be a compromise on the food. This wasn’t the case whatsoever, and the food was stunning! 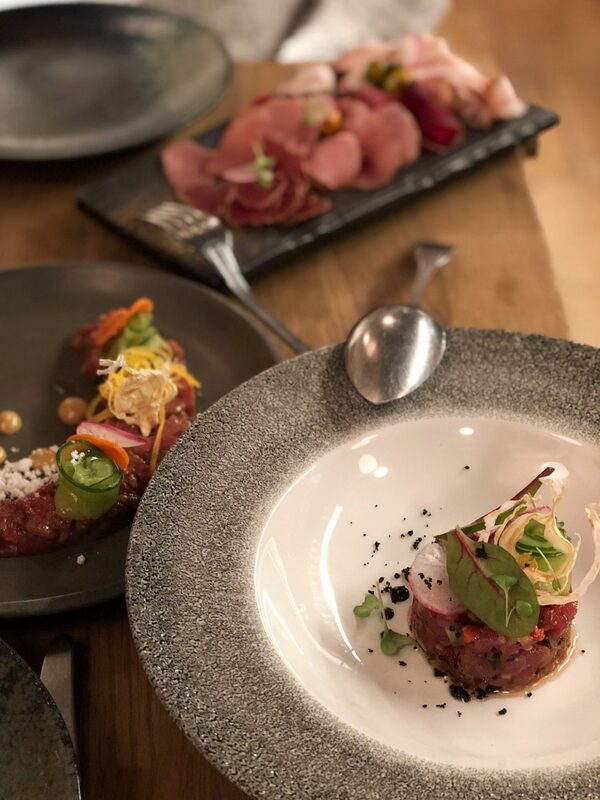 The waiter recommended that we order a few starters to share, so we began with a homemade charcuterie plate, venison tartare and tuna tartare. 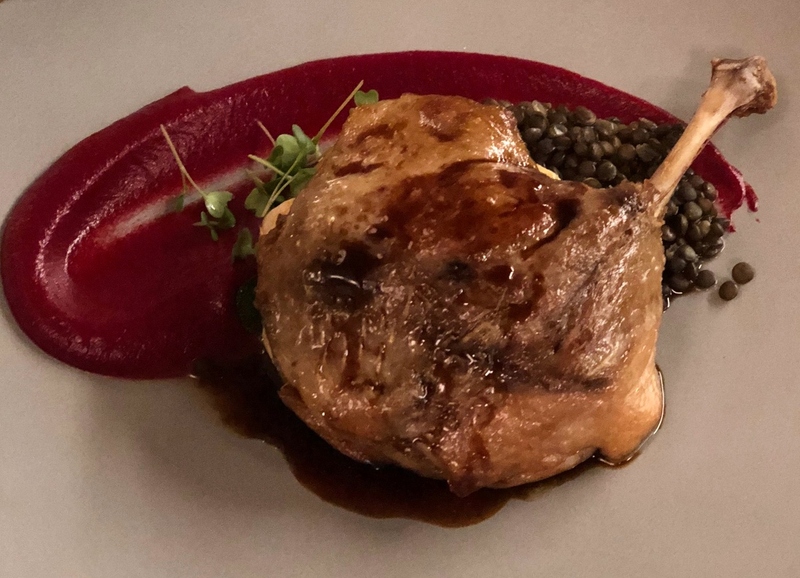 We then moved onto our main courses of confit duck leg – if this is on a menu I always order it, and I was definitely not disappointed. Every dish was perfectly presented and packed full of flavour, I honestly don’t have a single criticism. The service was spot on (when I finished my glass of wine it was refilled in less than 20 seconds), and although this was the most expensive meal of our trip, it was still pretty reasonable. 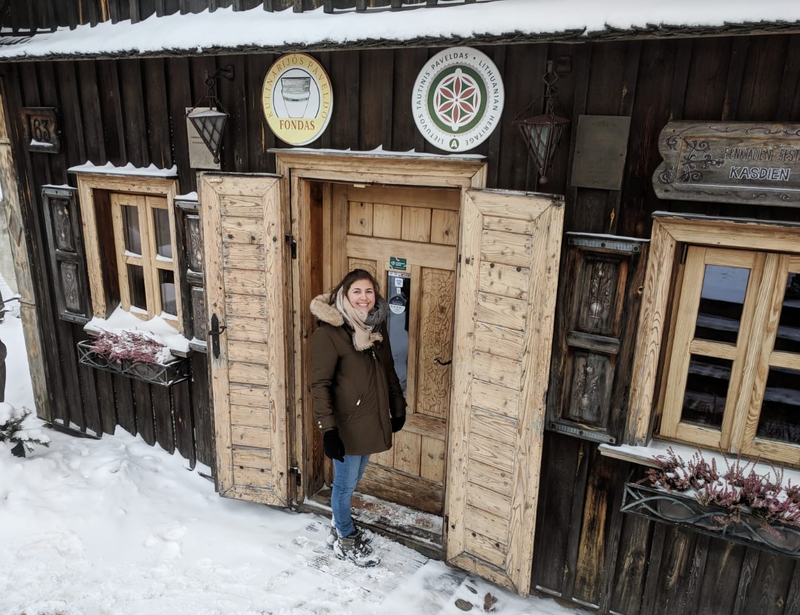 This restaurant in Užupis serves up a three hour tasting menu, which only uses local produce and therefore changes constantly based on local nature and weather. Traditional food is served in a modern manner and it looks amazing! Again seasonality is key for this restaurant, with the menu chaning on the first Tuesday of each month.The rule here is that nothing is ever to be repeated! What made me really want to visit this restaurant is that the evening menu is served at an appointed time only (7pm) and is not served according to individual orders but to what the chef wants his guests to taste. We very nearly went here on our last night instead of Somm because we bloody love a curry! 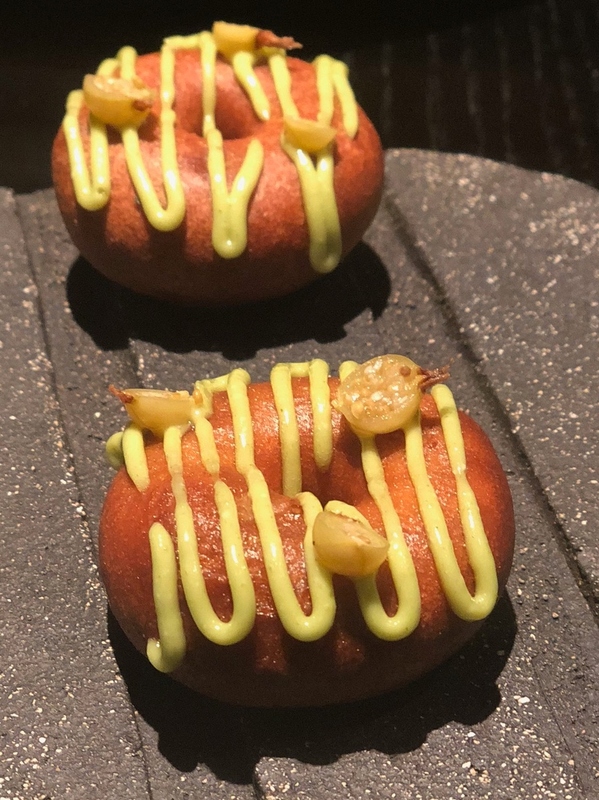 This restaurant combines Indian spices (apparently the chef has a secret blend of spices that is very difficult to decipher and unique to Europe) with Lithuanian produce to produce a unique modern cuisine. Definitely number one on my list for next time! So there you have it, a pretty comprehensive guide to my favourite cafes and restaurants in Vilnius! I’d love to hear anywhere I’ve missed out on so please get in touch if you’ve been and have any favourites.